A former commanding officer of HMS Gloucester called it "the end of an era" as the destroyer left Portsmouth for the last time bound for the scrapyard. 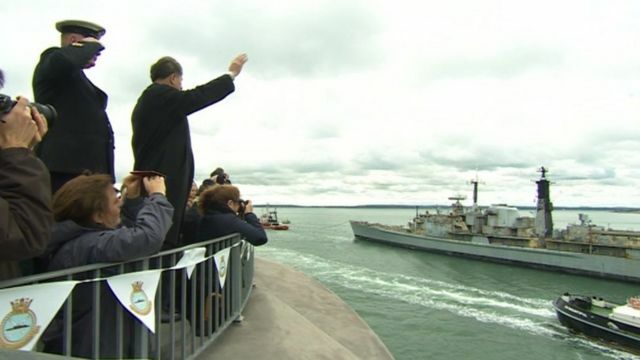 Former crew members joined those who turned out to wave goodbye to the Royal Navy's last remaining Type 42 destroyer. Known as "Fighting G", the ship was decommissioned in 2011 after 25 years of service. It will be dismantled in Turkey. Rear Adm Philip Wilcocks, who was in charge of Gloucester during the Gulf War, said it was an emotional day.